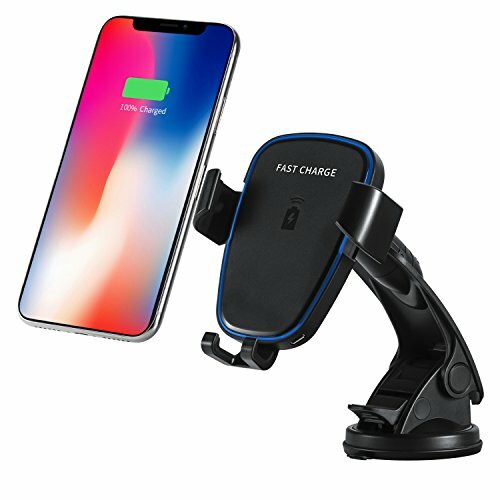 When driving a car, you only need to place the phone on the wireless car charger bracket, it can quickly and wirelessly charge the phone, and the phone can be firmly clamped in the wireless charging bracket, customers can use phone navigation while charging the phone, Placing and removing the phone is very quick and easy, which can avoid the occurrence of traffic accidents while driving. Only Samsung Galaxy Note 8/Note 5/S8/S8 plus/S7/S7 edge/S6 edge/S6 edge+ support fast charge mode, Make sure your phone is in the sensing area while charging. During charging, it will be a little hot which is a normal phenomenon. If your phone case is metal or the case's thickness is over 5mm, Please remove it to ensure effective charging. FAST CHARGE: Maximum support 10W of fast wireless charging, charging performance improved 200% than the standard wireless charging adaptor (need use QC2.0 / 3.0 adaptors and smart phone need support fast charging mode). Charging while driving,perfect charging experience, compatible with 5W Qi Standard smart phone wireless charging. TWO WORK MODES:Wireless car charger to provide customers with the suction cup bracket and air conditioning mounting bracket.With the two installation modes, customers can choose any kind of installation mode according to their preferences, the installation angle can be freely adjusted according to customer's requirement to meet different customer needs of the product with good experience. GRAVITY SENSING BRACKET:With gravity linkage principle, place the phone into the bracket, the bottom of the phone downwards by the phone gravity , the internal linkage mechanism pull the left and right sides of the clip automatically to clamp the phone. customer can operate by one hand, it is very convenient to place and remove the phone from the bracket . COMPATIBLE WIHT IOS&ANDROID PHONES: Supports iPhone8, iPhone8 Plus , iPhone X, Samsung Galaxy Note 8, S8, S8 Plus, S7, S7 Edge, S6, S6 Edge, S6 Edge + and other devices which supports Qi.